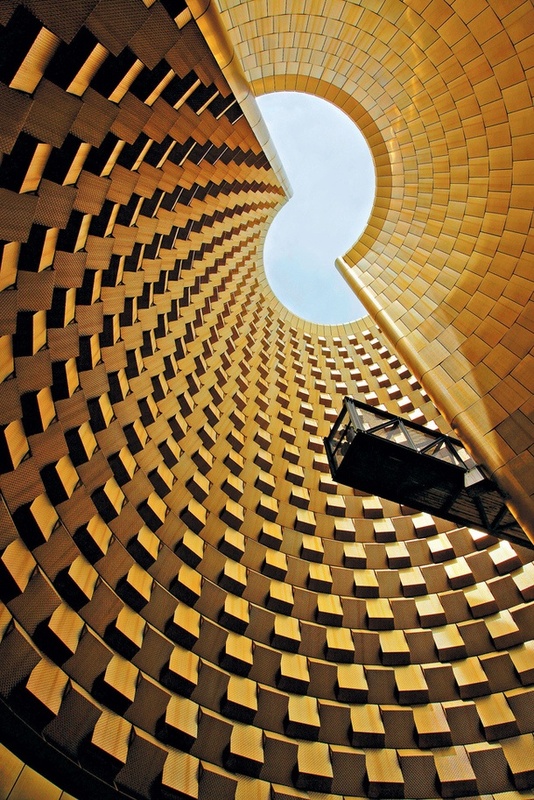 Vulcania, the "European Park of Volcanism", is an educational Amusement park and museum with a volcano theme. Situated in Saint-Ours-les-Roches, Auvergne, France, 15km north-west of Clermont-Ferrand, it was officially inaugurated in 2002. The architect behind the design of the park was Pritzker Prize-winning, Austrian Hans Hollein. Three-quarters of the foundations are sunk underground, which aided in the rehabilitation of the land. Visitors approach a 'metaphorical Volcano' by descending down a ramp towards a cone shaped structure clad in dark stone and lined on the inside with a gold metal.